Relentless. That’s the word Dr. Shawn Robinson uses to describe himself. A 37-year-old husband and father, Robinson has a PHD in Language and Literacy. 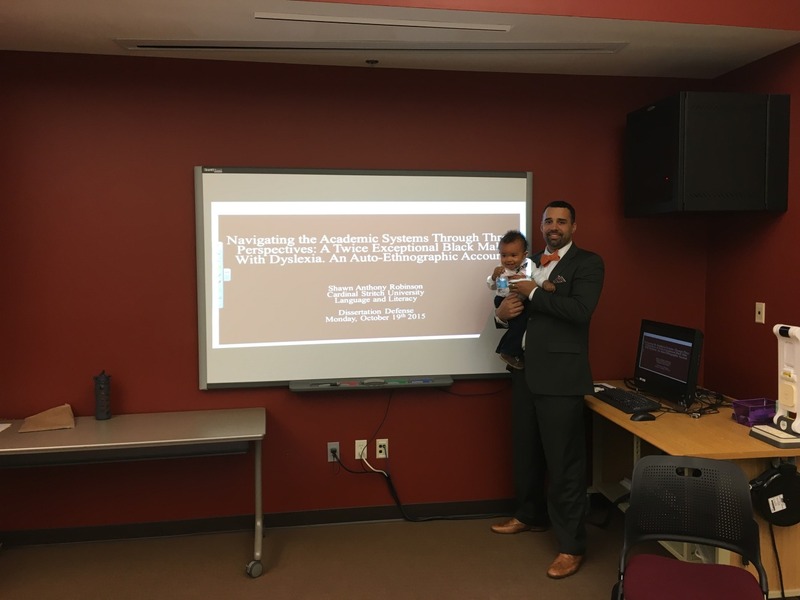 His research and advocacy for the education of young black males has led him from implementing literacy programs in prisons to presenting his research before a White House task force. With the determination and confidence he displays, it’s hard to imagine that several years ago Robinson could barely read. At age three, Robinson had very few words in his vocabulary. A local children’s hospital in Chicago determined that he had a speech delay and provided him with speech therapy classes. However, when Robinson began grade school in Evanston, his difficulty with reading and writing became even more apparent and manifested in his behavior. While there is no scientific evidence backing a racial genetic component linked to dyslexia… black males, who come from impoverished communities with insufficient learning environments, have more at stake. After being tested multiple times and without a special education program within his community, Robinson and his mother, Michelle Myers, relocated to another school district located north of Evanston, Illinois in the suburb of Wilmette. In this new learning environment and with the help of home-tutoring services, Robinson’s reading began to improve. However, being a biracial teenager in their primarily Caucasian neighborhood presented a new set of challenges, which began on his first day of junior high school. Robinson continued to be singled out as a freshman at New Trier High School, one of the top schools in the state of Illinois. He would divide his time taking classes between the main campus and an alternative education center for students with learning challenges. It was during that time that he was given the opportunity to help coach Special Olympics, an athletic program for students with disabilities. Working with students that had Down Syndrome, Cerebral Palsy, and other conditions gave Robinson a new outlook on his personal struggles. In 1995, when it was time for Robinson to attend college, he and his mom visited a career counselor, but with Robinson’s low grades the counselor said that college was not an option. Robinson’s mom couldn’t accept that her son could not get into any college, understanding that after all, it was education that changed her own life and opened up the door to her nursing career. While seeking out options for her son, Robinson’s mom was referred to a program 160 miles away at the University of Wisconsin, called Project Success. Created in 1979 by Dr. Robert T. Nash, as a small remedial program, it focused on providing students with the basic language skills needed to compete in a collegiate setting. Robinson was 17 when Dr. Nash revealed that his struggles over the years could be attributed to something he’d never heard of before—dyslexia. After meeting with Nash, Robinson began Project Success at the University of Wisconsin Oshkosh and a few weeks later he was officially accepted into the university. Nash, who became aware of his dyslexia at age 48, pulled from his own experiences to connect with Robinson. Nash used to memorize his textbooks to pass collegiate exams, before his research led him to develop Pure Complete Phonics, a very comprehensive reading plan that utilizes the all-inclusive sound structure of American English. This plan he would eventually teach Robinson, and Robinson would use to help others. It would take Robinson six long years of playing catch-up at a collegiate level, before he would receive his B.A. in Human Services in 2002. He credits his success to Nash, the Project Success program, and professors and mentors who aided him along the way. “Now I love on students who are in similar situations as I was, and give them hope,” said Robinson. After Robinson received his college degree, he applied to the School of Education at DePaul University in his native city of Chicago. His GPA was below admission requirements but with the support of a professor there he was given probationary admittance under the conditions that we would need to earn three Bs or better to continue in the program. Robinson came one grade short of meeting that bar, but was ultimately accepted into the program. While there is no scientific evidence backing a racial genetic component linked to dyslexia, in Robinson’s experience, of those affected, black males who come from impoverished communities with insufficient learning environments, have more at stake. His personal struggle drove him to pursue his doctorate in this field of study. Robinson is still active with the Special Olympics in his local community and travels back to Wilmette whenever possible to volunteer. He is grateful for the handful of mentors who did their best to support him in high school and college. Utilizing his personal experience and professional education, he continues the work of Nash by mentoring other students with dyslexia. Robinson still struggles with his Dyslexia, but that’s not stopping him. His mom, who fought so hard for his future, encourages other parents never to give up. “Regardless of the color of your skin, your ability to pay, your educational background,” said Myers. “There is always a college for everyone.